I started this blog as a vehicle to record random grace notes in my life, and as I observed these moments occurring around me. Some posts live up to that vision more than others. Recently, this has been more a travel journal, although a very sporadic one. And it has been, at times, a chronicle of how I/we (Rob and I) migrate toward a next home, and a redefined work life. Today is another post on travel. But really, isn’t the best travel about grace notes? And the unexpected pleasures you find along the way? So I tell myself, I’m not really straying too far from my theme, right? So, Miami. We chose to spend our last full week away from Alaska (heard from a friend there today…it is snowing!) in the south of Florida, partly because you can never get enough sun when you live in a rain forest, and partly to look a little closer at this region of the country. We’ve done the beach, lounged by the pool, sampled some local fare, and today we’re driving down to the Florida Keys. But that’s another post. Miami in March is warm, actually in the perfect temperature range. Sunny and warm enough to be pleasant, but not too hot, and the humidity is about right. Most of the days have been clear, perfect for being out and about, whether meandering down one of the shopping/dining districts like Lincoln Road Mall or Ocean Drive, or strolling along the beach. We’ve sampled some great food. Cuban food is everywhere, but this is a cosmopolitan city, so you can find great food of any cuisine you like. The local restaurants we’ve visited have been good, not necessarily expensive, but authentic. I Google “best…” and read reviews to see where to go for the best Cuban sandwich, burger, etc., in Miami. People – reviewers – are amazingly frank and generous in giving their opinions, sharing the good and bad. 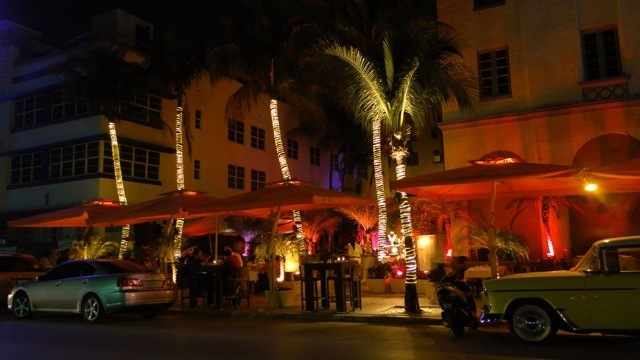 A plethora of restaurants along Ocean Drive have outdoor dining. You can also find an amazing variety on Lincoln Road Mall, everything from Italian to Sushi to pub grub. Eating outdoors is a particular pleasure in this season because it is warm. Not hot. Warm. And if the evening gets even the slightest bit chilly, the big outdoor patio warmers appear, and then it is warm again. Mmmmm, my favorite. We’ve had the benefit of Google maps to help us navigate the city, so haven’t gotten too lost. The traffic has been good in the evenings, not so good during the day. This is a metropolis, after all, and a big one. The drive into Miami Beach from Doral, where we’re staying, is lengthy, up to an hour, depending on traffic. Driving over during the day, you get a beautiful view of the waterways and the huge skyscraper buildings that are iconic to downtown Miami. The historic Art Deco section of town is amazing, with old buildings that have been lovingly preserved or restored to perfection. You can learn about celebrities of the past who used to stay in this hotel, or frequent this restaurant. There are restaurants and night spots, upscale stores and tourist traps, positioned randomly throughout the district. Imagine my surprise at seeing a “Duck Tour” bus yesterday (amphibious vehicles that take tourists around town and into the water.) Ketchikan has Duck Tours too. You walk down the streets of Miami Beach and see a mix of people, the ones who are obvious tourists, like us, and the “beautiful people,” the rich young residents of this area who typify the South Beach look. And there are the hawkers who are trying to persuade you to come in to their restaurant, shop their store, buy cigars. Yes, cigars. There are actually cigar girls, who stroll around with boxes of cigars for sell. Makes me think of old artwork I’ve seen or magazine ads that show “cigarette girls” from some long-ago era. But this is today, and they are selling cigars. We actually watched cigars being hand-rolled at a street shop. Very labor intensive. Little straw fedora hats are in style here, for both men and women, and huge heels. I’m fearful for some of these women walking around on the heels I’ve seen. Now, I like a good heel as much as any short woman, and in my work environment, or any time I go out “dressed up,” I wear heels. Just part of the look. But I’m talking about a whole new animal here. These women are on stilts! Clothing is all over the place. I see a lot of long (I mean floor length) knit dresses that are worn any time of day. On the other end of the spectrum, yesterday I saw a string bikini that gave new meaning to the word “string.” And prices of swim suits…I looked at a few that were in the $200 range…nothing special. I know Miami Beach is a high rent district, but still…there are a few stores in the area that haven’t heard of recession. Hi Shiela! Sounds like a wonderful trip! I have always wanted to visit the Keys. I think it would be fun to take a post-retirement adventure there to set up shop as a face painter, hair wrapper or something equally as fun 🙂 Annnnd – I LOVE Duck Tours! It was the highlight of my trip to Boston a few years ago. Ok, as you can see, I’m way behind with responding to comments! Fun thing to know that Duck tours are in all these coastal cities. I had no idea! I knew they were in the Northwest, but didn’t know they were in other regions. I have never been on a duck tour, but maybe I should do that. After being in Alaska for a while, I bet the Miami atmosphere is delicious! They seem like total opposite ends of the spectrum – equally beautiful but in different ways. Enjoy and get plenty of sunshine to boost your vitamin D.
It was great fun to be out and about, and in sunshine! However, we came back up to a great stretch of sunny days, most unusual for SE Alaska this time of year!